From its first year, we now have 54 professionals on the register and hopefully many more now considering their applications. The meeting is an important annual event for the plant health and seed inspectors to get together, as many of them work solo surveilling their patch and enforcing legislation. 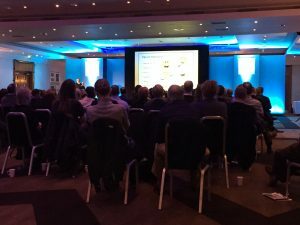 It’s also an opportunity for the chief plant health officer to set out the bigger picture and for others to show developments in research and technology as well as potential threats to UK plant health. The theme of the meeting was “Working together” and this group of people certainly do. They are as much front-line workers as NHS workers and bear the responsibility of trying to limit the devastation that disease could cause to our food supply and environment as well as the unfortunate need sometimes to issue notices that threaten peoples’ businesses and livelihoods. How does someone apply? At present, applications are welcome from government employees through their mentor, but as chair of the Plant Health Register Advisory Board and an assessor, I too have applied and have been successful. Though not directly involved with the work of the inspectorate, I have 30 years academic experience in plant science that includes plant health. The application is competency based and relates to the GB Strategy for Plant Biosecurity pb14168-plant-health-strategy. It took me about a day to get my head in the right space to know what evidence I could provide for each competency and a good part of another day to complete the form; but on both of these days I could fit in other less cerebral tasks as well. Further guidance notes are at https://www.rsb.org.uk/careers-and-cpd/registers/plant-health-register. Where next for the register? Our next objective is to engage with relevant expertise outside government e.g. trade and academia and this is ongoing. If anyone would like to find out more, please get in touch. Perhaps not surprisingly, some of the older delegates at the meeting felt the register had little to offer them, but there was a noticeable interest from younger delegates that this kind of professional recognition would be helpful for their career development. We certainly hope this will be the case and that we can all build a profession to acknowledge the diverse skills needed for plant health that will attract new talent from the next generation. Finally, as an elected member on the register, I am entitled to use the post-nominals RPHP (registered plant health professional). Other levels are APHP (associate) and SPHP (senior). I’m not someone who seeks letters after my name, but if we’re to build the register, we need to let people know about it, so how about it everyone – if you’re already on the register, use the post-nominals.